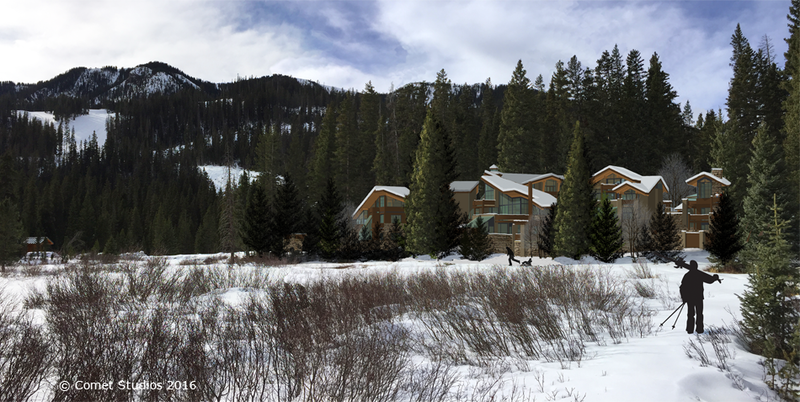 GaiaQuest’s anticipated Alpine Center was to be integrated into a demonstration alpine wilderness eco-resort community project conceived to offer the most exciting sustainable alpine resort lifestyle available anywhere. Thoughtfully master planned to enhance and grow year-round business and prosperity for Taos Ski Valley, GaiaQuest proposed a regeneratively sustainable Alpine Permaculture Demonstration Center, seamlessly integrated into a comprehensive alpine eco-resort community demonstration project called Kachina Mountain Lodge (KML). As part of the KML project planning effort, GaiaQuest started with an overall master planning process for the whole Kachina basin and the related creation of a regeneratively sustainable solution for all remaining undeveloped property in that area. The resulting master plan included boutique hotel facilities, spa facilities with health bar, fitness/training center, conference facilities, restaurants, cafes, beverage bars, convenience market, year-round food production in greenhouses, medicinal plant distillery, various commercial uses, year-round recreation amenities, engaging education & recreation programs for all ages, arts and entertainment programs, private residence club, nature center, glamping (glamorous camping) facilities, wilderness camping and more. Master planned as a permaculture based pedestrian oriented wilderness community, all community facilities, businesses and homes were conceived to be conveniently interconnected by beautiful alpine food forest ecosystems, parks and trails. Project also proposed to introduce a more peaceful wilderness experience in Kachina by developing public transportation for public access and eliminating all unnecessary car traffic to and from the Kachina Basin. This important community planning project was taken over by other Kachina Basin stake holders and the Village of Taos Ski Valley after GaiaQuest decided to develop our primary permaculture demonstration center facility in Taos, integrated into the new Tarleton Ranch Eco-Village project. With this new project, GaiaQuest’s longstanding interest in Taos Ski Valley has expanded to include pursuing work force housing and enhanced local food production on a larger scale where it can be more appropriately created in nearby Taos, as part of the Tarleton Ranch Eco-Village Master Plan created by GaiaQuest.